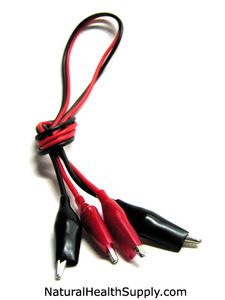 One pair of Mini Alligator Leads - black and red. Each Mini Alligator Lead is 2 feet long with an alligator clip on each end. Please note that when ordering electronic parts and kits we can assume no liability on the customers ability to use them. Safety, craftsmanship, experience, and ability are the user's responsibility. Electronic parts are small and fragile. We can not offer refunds or replacements on electronic parts. Buy electronic parts and kits only if you believe you can accomplish the work. If you experience difficulty with your build, or have little experience in electronics, please order extra parts. We can not offer refunds or replacements on electronic parts.